Baseball is nuts here. Every base has a team, with natty custom uniforms and groomed fields to play on. Every field unit, down to battalion size or even smaller, has a competitive team with whatever equipment they can get a hold of. Somehow every ship with more than 9 sailors on it shows up with a team itching to play (I suppose they practice over the water with sharks and rays as bases). Leagues form up spontaneously any time two teams are within a day hike of each other. The Navy formally organizes a larger league for the whole Marianas. You’ve probably read about the top level leagues run by the military. If you don’t follow, know that last year Navy beat Army for the “Pacific World Series” in Hawaii. Both are dead serious about putting up good teams for the rematch this year. Today a top-flight match was played on a professionally laid field. Construction teams here did not neglect sport and recreation facilities, and Trimble Field is one of their best. Named after Jimmy Trimble, who passed on a pro contract to fight with the Marines and was killed at Iwo Jima, the field has a fine scoreboard and a few small grandstands. 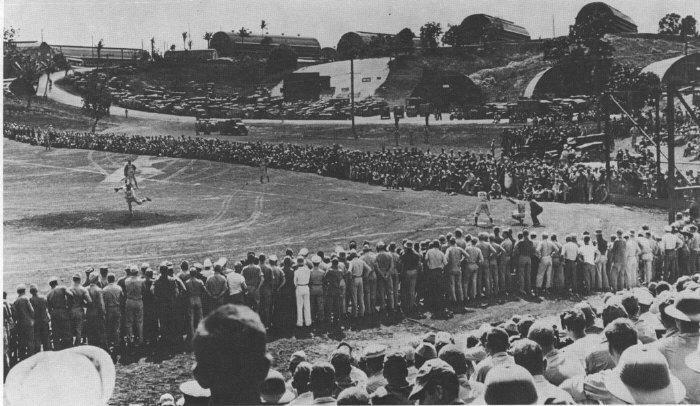 The top teams of the Third and Sixth Marine divisions faced off for a full nine inning game. It’s an open secret that major leaguers in the military are kept out of risky combat roles, but the Marine divisions still have plenty of ringers. I hitched a ride up to the field, which wasn’t hard because practically everyone was heading there. Upon arrival I gave up hope of watching much of the action. The few grandstands were burdened with brass, and guys were standing ten or twenty deep along the foul lines, all the way out further than Ty Cobb’s longest home run. People watching was going to be my sport for the afternoon.